A 55-year-old man was diagnosed with the end-stage heart failure. He was enrolled in the waitlist of heart transplantation. The patient was scheduled for heart transplantation as the donor heart became available. Anesthesia induction was uneventful. Right radial artery was cannulated for invasive pressure monitoring and pulmonary artery catheter sheath was introduced into the right internal jugular vein. After midline sternotomy and adequate heparinization, aortic and bicaval cannulation was performed to establish cardiopulmonary bypass. The recipient heart was removed, and the donor heart was inserted in its place using bicaval anastomosis technique. During weaning from cardiopulmonary bypass, Swan-Ganz catheter More Details was inserted into the sheath already in the right internal jugular vein. The balloon of the catheter was inflated after inserting 20 cm length of the catheter. As the catheter was further advanced even beyond 40 cm, right ventricular waveform was not observed. Transesophageal echocardiography neither revealed catheter in the right atrium nor in inferior vena cava. Where the catheter was floating could not be ascertained echocardiographically. Azygos and innominate vein palpation by the surgeon did not find malposition of the catheter. The catheter entered superior vena cava (SVC) cannula instead of right atrium during the insertion process. As the patient was on partial bypass during weaning, drain from SVC cannula was observed to be decreased. Careful examination of the cannula revealed the Swan-Ganz catheter with inflated balloon [Figure 1]. During cardiac transplantation, it is very essential to monitor pulmonary artery pressure and right ventricular function. Invasive monitoring of pulmonary artery pressure and pulmonary vascular resistance by Swan-Ganz catheter can guide weaning from cardiopulmonary bypass. Transesophageal echocardiographically is able to rule out malposition of the catheter in coronary sinus, intracardiac knotting, in inferior vena cava, or hepatic vein, as was done in the present case. Even azygos and innominate vein placement of the catheter can be suspected by palpating the vein in an open chest. However, it is very unusual and unreported misplacement of Swan-Ganz catheter floating into SVC cannula. Cardwell ME, Winter B. Pericardial placement of a pulmonary artery catheter. Anaesthesia 1998;53:290-2. Baciewicz FA, Nirdlinger MA, Davis JT. An unusual position of a Swan-Ganz catheter. Intensive Care Med 1987;13:211-2. Davis MS. Hepatic vein obstruction due to Swan-Ganz catheter placement. Chest 1994;106:603-5. Park SK, Gil NS, Kim A, Ryu HG. 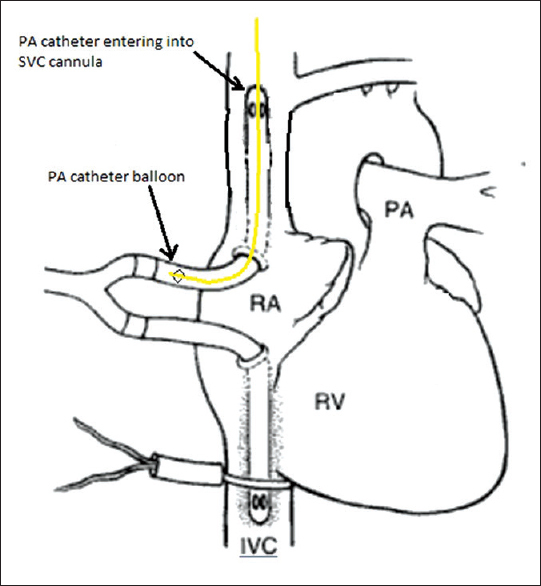 A misplaced and entrapped pulmonary artery catheter. Korean J Anesthesiol 2013;64:380-1.